Thank you for visiting Evangeline's homepage. A member of the New York Philharmonic for more than 40 years, Evangeline is widely recognized as a performer, educator, clinician and teacher of the cello and the Alexander Technique. Her innovative methods focus on achieving efficient movement for musical results. She is the author of Cello, Bow and You: Putting It All Together, published by Oxford University Press. Medici.TV, the world's leading classical music channel, has added master classes with Evangeline, produced by iClassical Academy, to their illustrious roster of online master class resources. 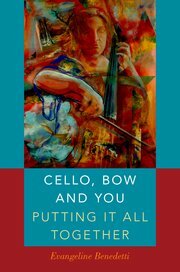 The Violoncello Society of New York hosts a book launch of Cello, Bow and You: Putting It All Together including a hands on workshop with author Evangeline Benedetti on May 1. CLICK HERE for more information. Evangeline will be a featured speaker at the Annual Conference of the American Society for the Alexander Technique in San Diego, June 14-18, 2017. Evangeline Benedetti's teaching work is featured in the November 2016 American String Teacher Journal in an article by Dr. Lochlan Dent. ASTA members can access it by CLICKING HERE. BLOG: In Conversation with Evangeline Benedetti. Oxford University Press, 2016. PODCAST: Mind, Movement and Music: Teaching the Alexander Technique to Orchestra Musicians. An interview with Robert Rickover. REVIEW: Using the Alexander Technique When Playing with a Symphony Orchestra; Workshop Review from the American Society for the Alexander Technique. Evangeline discusses memories of her 40 plus years as a member of the New York Philharmonic. CLICK HERE to listen to and purchase Evangeline's latest recording. Attend virtual masterclasses with Evangeline at iClassical Academy where for little as $4 per month you have can have access to hours of cello, violin and piano masterclasses.